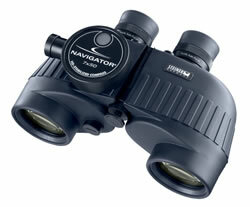 If you're looking for a reliable marine binocular for use around the water, look no further. The Navigator 7x50 (with compass) works just perfect for wet conditions found during activities like boating. Comes equipped with High-Contrast-Optics for brightest possible images in low light and maximum contrast in bright sunlight conditions or rough weather. With illuminated compass and the added comfort of the STEINER Sports-Auto-Focus. No need to constantly refocus: enjoy the fact that you can adjust for your vision once and enjoy sharp viewing for ever, in any situation even at varying or rapidly changing distances. The shock-absorbing and abrasion-protected Makrolon fiber reinforced polycarbonate body with slip-proof tough rubber armor makes the Navigator 7x50 (with compass) the perfect navigation binocular. The STEINER waterprotect-System makes this binocular water pressure proof to 2m. Featuring a fog-free performance by using the unique 2-valve system of dry nitrogen filling. The Navigator 7x50 (with compass), the perfect pick for practicality, dependability and economy in the same package! Exit pupil: 7.1, Field of view at 1000 m: 118, Luminosity: 51.0, Twilight factor: 18.7, Weight (g) : 1125, Height (mm) : 140. Comes complete with strap, case and a 10 year gurantee.